From Route 31 in Francestown turn onto Crotched Mountain Rd (look for signs leading to Crotched Mountain rehabilitation clinic) and follow it 1.5 miles to a parking area on the left. Several trails disperse from the parking area at Crotched Mountain Rehabilitation clinic. 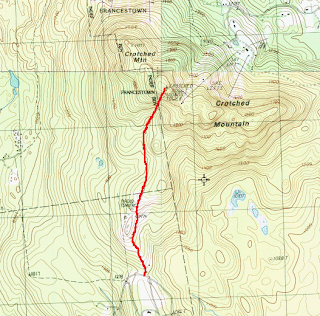 I would recommend following the Gregg Nature trail to the start of Shannon's trail leading to the summit. If you want a more direct route follow the gated access road 0.2 miles to a wooden "summit" sign pointing right. Shannon's trail dips a bit with the Gregg nature trail paralleling both sides of the grassy trail. Cross the nature trail and ascend to a large open field. Shannon's Trail is challenging to follow through the field and I had to look for the discolored and padded down grass to determine it's direction. The trail continues along the eastern edge of the field and enters the woods soon reaching a junction with "the link". Continue north on Shannon's trail as it descends to a stream crossing then moderately ascends to a merge with the Bennington trail. Shannon's trail ascends steeply over granite ledges providing several outlooks along the way. You'll eventually reach a picnic area which is the nicest spot on the entire hike and the summit a few hundred feet away. The summit is marked with 2 benchmark disks, one is a golden color the other is illegible. 4 concrete footings are the only remains from a former fire tower and there is a fenced in communications facility with cell tower. There are 2 bumps that could be the highest point, one contains the golden benchmark the other high point contains the illegible benchmark and the fire tower footings are at the slightly lower 3rd bump. 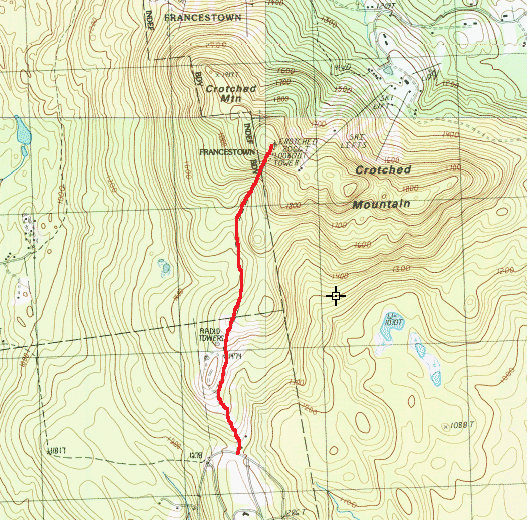 At 2066 feet, Crotched Mountain is the 3rd highest peak in Hillsborough county (Pack Monadnock and North Pack are taller) and the highest point in Francestown. It is the 284th highest peak in New Hampshire and home of Crotched Mountain ski area. It's summit contains a communication tower and facility, 2 benchmark disks and the remains of a former fire tower. The fire tower was built in 1915 and stood 45 feet where it remained in service until the early 1970's. It was removed in the early 1980's. Views are limited from the summit however an excellent viewpoint and picnic area can be found a few hundred feet away. A picnic spot outlook near the summit.